Hello old friends and new, I am back! It’s been awhile since I’ve written and I am so excited to be at it again! Rebranding has proven to be more of a challenge than I anticipated, so I am happy to take this step in the right direction. I hope you all like the new look of The Nikki Standard! And now on to the good stuff, my first look of the summer! 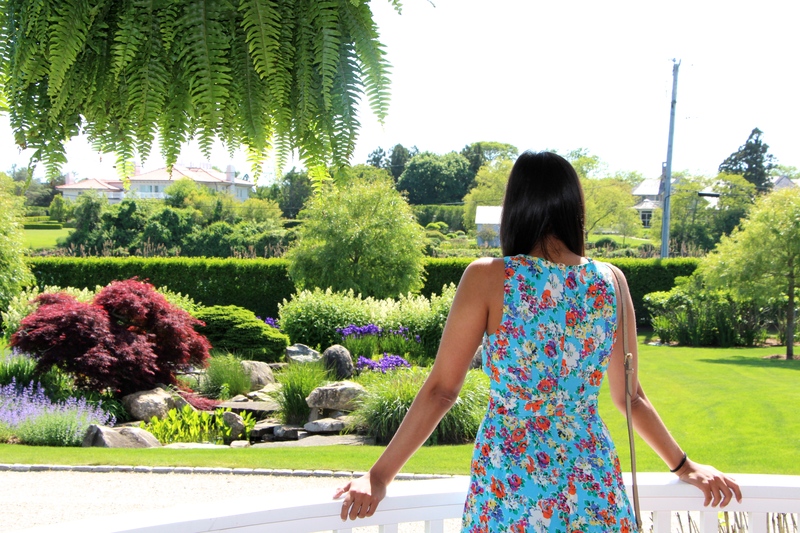 On a recent weekend getaway to the Hamptons, I couldn’t resist taking photos on the beautiful grounds where we stayed. One of my favorite places was the mini pond, which actually housed lily pads and frogs! With such a picturesque view, how could you not indulge in capturing the scene?! To match the colorful, natural surroundings, I knew exactly which outfit to throw on: My floral romper. I wanted a lightweight outfit that would allow me to dip my feet into the ocean, keep me cool throughout the warm summer day, and bring out my playful side as I pranced around the yard. This particular romper is one of my favorites because its cutesy, vibrant print has a flirtatious touch with the mid-section cut-out and front cross design. Showcasing the romper as the focal point, I then added muted light gold accessories to the mix. Take a look at my whimsical garden shoot and shop the look now!